The most anticipated music event is back to downtown El Paso and I couldn’t be more stoked! 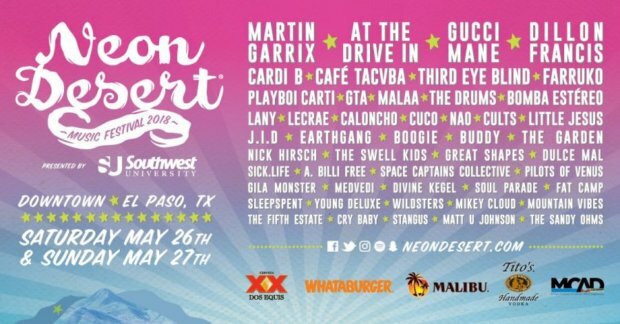 Neon Desert promises to produce their annual music festival for El Paso by El Pasoans, while providing the local artistic community an outlet to showcase their talents alongside national and international headliners. DJ Martin Garrix, alternative rock band At the Drive In, rapper Gucci Mane and DJ Dillon Francis are set to headline the music fest. They plan to have multiple outdoor stages, local and regional artist displays and a diverse music line-up will light up the southwestern skies Memorial Day Weekend! Needless to say, I’m really looking forward to this unique celebration of music, diversity and the borderland culture.